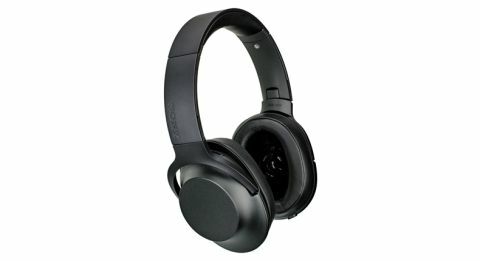 Sony h.ear on MDR-100AAP review | What Hi-Fi? God, to paraphrase Sony’s promotional material for their new h.ear on-ear headphones, is in the detail. But might we also suggest a separate idiom, about woods and trees? We have few initial complaints about the h.ear ons; they don’t perhaps feel as premium as we’d expect for £150, but they’re impressively light and fold away tidily. With an inline microphone on their tangle-free cable, carry case included and draped earpads Sony claims will reduce sound leakage, that’s pretty much all the boxes ticked for portability. And with a choice of earpads in five colours, it’s likely there’ll be one you’d fancy being seen wearing as well. Creating noise is a pair of 40mm HD drivers working in conjunction with titanium-coated diaphragms, whose rigidity Sony claim to minimise distortion and deliver rich, vibrant sound. Also featured is a bass boost, for those fond of an extra portion of low end. At first wearing, the h.ear ons are comfortable as promised. Their cushioned ear pads and headband offset the 220g weight; our only caveat would be how warm our ears got while testing, a perhaps quite significant concern for those sticky summertime commutes. In sonic terms, we have to agree somewhat with Sony: there is a decent amount of detail here. Gifted with a roomy soundstage, the h.ear ons cope admirably with the chaos of At The Drive-In’s Relationship of Command. As Arcarsenal riles itself toward detonation of the beginning of the album, guitars antagonise each other in either ear and Cedric Bixler-Zavala exhales maniacally, instigated and provoked by a rumbling rhythm section. Even as the track explodes, the h.ear ons keep control, keeping aside space enough for the tick-tock stereo delay of Bixler-Zavala’s shrieks to slip off into the ether. We notice a rolling off in the treble, which softens the overall character of the balance, but it makes for an effortless listen with the midrange solidified by a decent amount of relatively agile low end. That kind of softening, however, is symptomatic really of our main grievance: the h.ear ons play a little too nicely. It is probably most immediately apparent with an energetic album such as this; we want the control, but without the feeling of restraint. The h.ear ons somewhat miss the volatility of Arcarsenal, struggling similarly with the driving groove of Pattern Against User, aggressive on/off blasts of One Armed Scissor and rant-like scolding of Sleepwalk Capsules or Mannequin Republic. It isn’t so much timing – the h.ear ons suffer a little in this respect when pitted against some rivals, but generally they are able to hold their own. But there’s a lack of punch and drive, and expression too. It’s a tentative sound, and it leaves us somewhat underwhelmed. Those weaknesses aren’t exclusively exposed by more raucous music. Playing Nick Drake’s comparatively fragile Pink Moon album shows the h.ear ons’ subdued dynamics are left wanting for expression, irrespective of genre. Drake’s delicate vocal doesn’t lack solidity, but it does lack the subtleties wherein lie its beauty. It is also difficult to discern the difference in vintage and production style between Pink Moon and Relationship Of Command, hinting that these headphones may not be as transparent as was initially suggested. We don’t want to be overly harsh – these are a respectable pair of headphones, and were they a little cheaper, we could readily get behind them. It’s just that we want the h.ear ons to take off the kid gloves every once in a while. For £150, we want more character, more nuances and more energy. As it is, we are left a little cold.